Parker Werns, Carolyn McDonald and Melissa McCleery are the 2015 Stand Up Award winners. Do you know a Penn State student who stood up for what is right? Each year since 2008, the Rock Ethics Institute has recognized Penn State undergraduate students who have demonstrated “courage, fortitude, and ethical leadership” by taking a stand for a person, a cause, or a belief. WPSU intern Julianne Tarullo met with this year's Stand Up Award honorees to discuss their work from mobilizing poverty relief efforts in Haiti to combating sexual violence at Penn State. 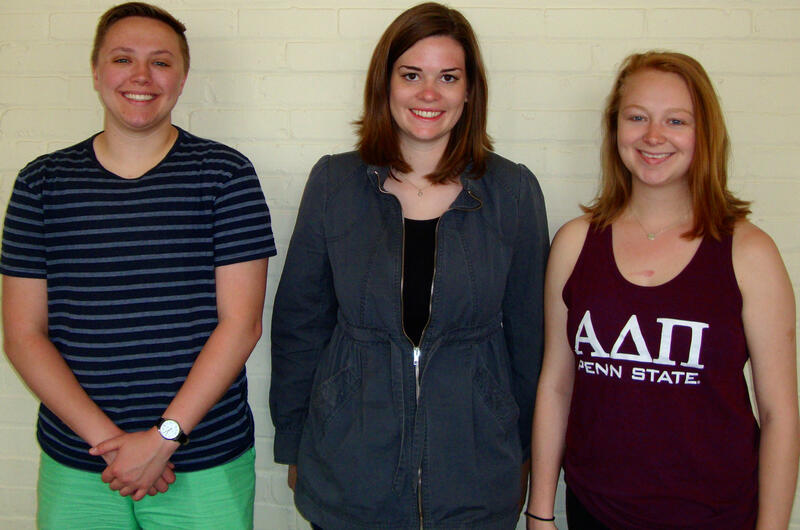 Carolyn McDonald, Parker Werns and Melissa McCleery have been chosen as the 2015 Stand Up Award honorees and will be officially announced as the recipients Friday, April 24 at the Nittany Lion Inn. Carolyn McDonald is a community, environment and development major and has traveled to Haiti ten times where she focused her efforts on education programming and teaching English at orphanages. In a few weeks McDonald will be moving to Haiti, where she plans to work full-time with a non-governmental organization. Fellow awardee Parker Werns is the student concerns chair of the President’s Commission for LGBT Equity. Werns is a transgender man who recently started his transition and advocates for LGBT representation and outreach. After graduation, Werns plans to continue his efforts at other campuses. Melissa McCleery is the chair of the University Park Undergraduate Association’s Sexual Violence Roundtable and a member of the University’s Sexual Assault Task Force. She’s being honored for her work to end sexual violence at Penn State and for her support of sexual assault survivors. She hopes to continue this type of work after graduation. All three students are excited their efforts have been recognized by the Rock Ethics Institute. But Werns says winning this award also recognizes the importance of addressing the needs of underserved LGBTQ communities. “It really means a lot because I think that recognizing people in the LGBTQ community shows that Penn State thinks that our efforts are important and also that those students should be valued,” said Werns. About 15 to 20 students are nominated for the Stand Up Award each year. Nominators submit essays about what the students have accomplished and the ethical issues their actions address. The nominations are then reviewed by the 4-member Rock Ethics Institute award committee. Each winner is awarded a $1,000 honorarium.